Too funny, whoever said I’m not tenacious! I wasn’t about to give up on my little red candle. So based on everyone’s great feedback, particularly Rhonda and Eva, I made some final touches leaving me with two options (threw out one of the close-ups) to add to our Christmas Card possibilities for 2014. 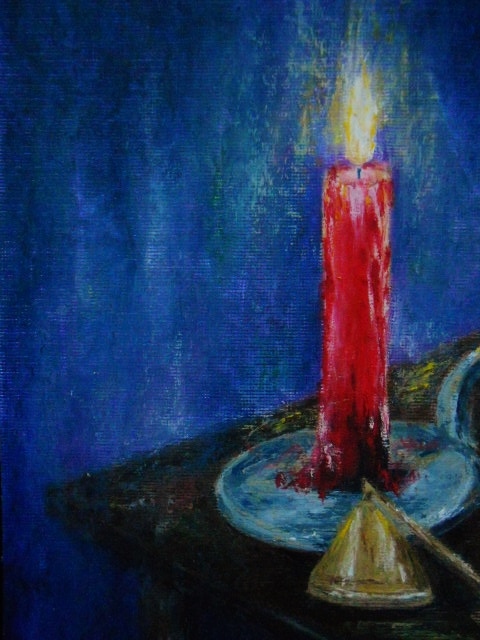 Red Candle, an oil pastel (7×5) was painted on white heavy card stock paper with mainly Senneliers and Neopastels. Notice the dripping red wax, glow on the walls and table, darkened top edges of the background to help achieve some glow (w/o dark you can’t have light) and finally some reflections on the table. Your feedback helped me see the scene more clearly, what a difference these changes made. 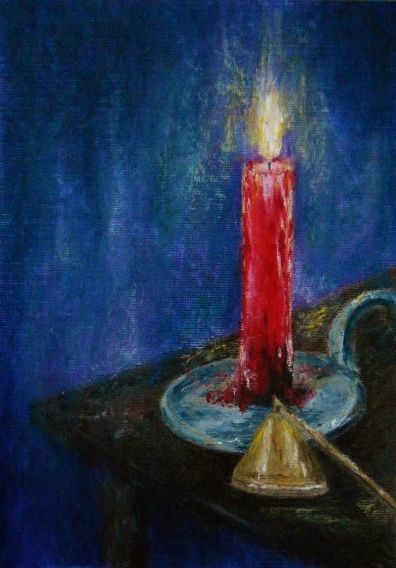 This entry was posted in About Oil Pastels, OPs New Paintings and tagged candle, Oil Pastel, painting, red, winter. Bookmark the permalink. Hi Karah, thanks so much. So sorry, just saw your comment – Happy New Year to you!! Hi Madhu, thanks so much – glad you enjoyed it! Mary, you are lighting up WP! You’re too much Elena – thank you for your kind words, I like the description! You are so funny M.R. – thank you and enjoy your time with friends! Yay Mary! Now the painting reads “light”. It’s beautiful! Well done! I’m so happy I didn’t offend with my thoughts. “The Word Press Community Project” is a perfect way to describe it. I think it’s great when artists can support one another. That’s how it was way back in the day….I’m talking way back to Monet’s time….they would paint during the day then spend the evenings together in the pubs, discussing art and techniques and giving each constructive support. That doesn’t happen any more, sadly. This is why I adore my art friends in blog land. So delightful! Loving the color! Thanks Eunice – a different kind of painting for me, don’t you think? Thank you Calee for your lovely comment, means a lot. Salute to the readers that gave you the ideas for the finishing touches. … and thanks for the dedication! Fun right Frank? Thanks very much and wouldn’t have gotten this far w/o other eyes helping to reveal the hidden elements. FYI: Your artistic nature will appreciate my current post (Connections). Looking forward to it Frank – oh man one day behind with my Reader and I’ve got close to 100 to get through. You’ll see me in a few. Thanks again! No problem … but being with an artistic flare, thought you would enjoy it. Thank you Marina – aw paintings like this don’t come easily for me, as you can see. So 2015 I’ll be challenging myself to work on still life’s/florals with a looser application of the paint. Thanks again, on to my next project! This is just so beautiful Mary. Bravo to the little red candle that didn’t give up. Have I read you well? Are you considering to print some of your paintings to make holiday cards? That would be great! Thank you Lis, means a lot! I’m more than happy to see the final result! It worked out just beautifully Mary and I feel honored that you considered my suggestions worthy of your painting! Love, love your dedication, it is very inspiring. “The WordPress Community Project” is a super cool idea and I’m definitively in for a repeat any time! The little red candle journey was a very exiting one indeed! Thank you Eva – your suggestion was perfect to top off the light w/n the painting. 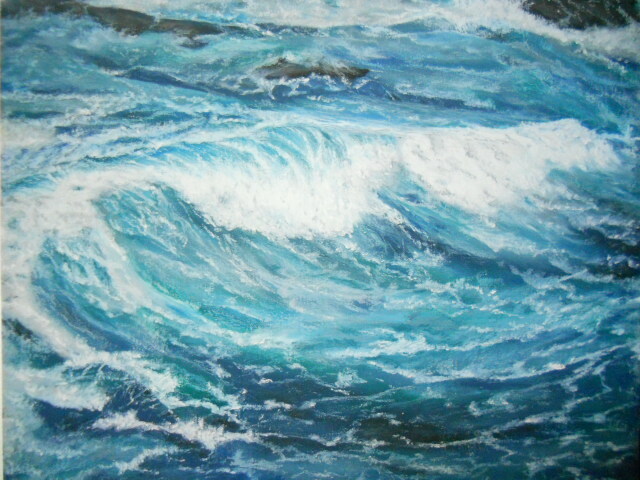 It’s fun to solicit feedback and then incorporate it into a painting – I love reading peoples opinions and thoughts. This time, as soon as I dragged a glob of red paint with a painters knife – I finally saw the painting and heard it (although it did take forever). Thank you, love your encouragement! Wish you could see my hands right now, they are stained dark blue from a sky I’ve been painting – lol, you just got to love it! LOL 🙂 you got to love it indeed! Shaped up so very well! Thank you Ashok and appreciate that you stayed with the process. Always a pleasure to view your amazing paintings. Thank you so much Lee for your generous comment ~ really appreciate it!